Income Tax Calculation is one of the most complex tasks for the common man. 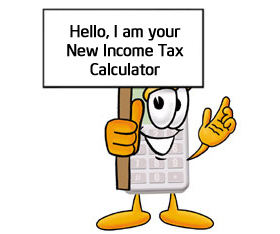 If you are searching for income tax calculator your search ends here. I am herewith Income tax calculator for the financial year 2017-18. It is simple excel based calculator specially made for salaried people. Using this calculator you can calculate your income tax liability for FY 2017-18 (AY 2018-19). Prior to looking at Income tax calculator let’s take a look at Income tax slab for FY 2017-18 and income tax changes recently made in Income tax. There are three slabs for the Income tax. Income up to 2.5 lakh is tax-free. 5% tax slab is applicable for income in the range of 2.5 Lakh to 5 Lakh. 20% tax is applicable for income in the range of 5 Lakh to 10 Lakh. Any income above 10 Lakh will be charged with 30% tax. In addition to above 10% surcharge is applicable for income above 50 Lakh & 15% surcharge is applicable for income above 1 Cr. In budget 2017 following income tax related changes are introduced. Tax rate for the lower slab is reduced from 10% to 5%. This leads to saving of Rs.12500 for income group between 2.5 Lakh to 5 Lakh. 10% surcharge is introduced for income in the range of Rs 50 Lakh to 1 Cr. RGESS tax exemption is removed from FY 2017-18. TDS is mandatory if rent amount is exceeding Rs 50,000 monthly. Maximum limit of Interest deduction on rented property is 2 Lakh. You can download Income tax Calculator from the link below. In order to calculate your income tax, you need to provide inputs such as your gross income, exemption amount. In addition to that, you need to provide information about the investment made by you under various sections. In the bottom section, you need to provide selection about applicable tax slab. You will be able to see tax applicable in Tax Liability section. This calculator is applicable for salary income only. This calculator is for people with single home. You will not able to calculate long term capital gain tax from this calculator. Hope this Income Tax calculator will be useful to you. Do share your views in the comment section.